Next week brings Dark Horse Presents #33, the latest installment of one of the best-known and most-respected comic anthologies, and the last for a while. In 1986, the company launched with the first issue of the first Dark Horse Presents series, which ran until issue #157 in 2000. 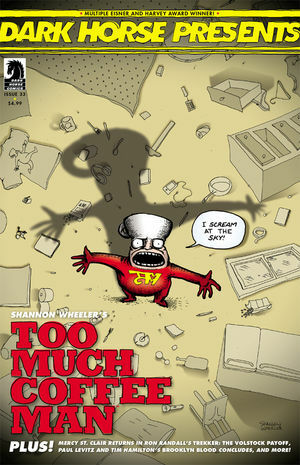 A second volume, with 80-page issues, began in 2011 and went for 36 issues, until spring 2014. (There was also a digital version on MySpace, also 36 issues, from 2007-2010.) This most recent, slimmed-down volume started in August 2014, and #33 will be the last issue, according to Mike Richardson’s editor’s note. Sadly, our comics market follows a predictable downward sales pattern with ongoing series and not even our award-winning anthology is immune…. I will point out that we’ve reached an astonishing 226 issues under the Dark Horse Presents banner, a number rarely reached by any comics magazine, and even less likely for a comics anthology…. I’ll leave you with this note: keep watching, for we just might be back with a new format and a star-studded lineup. Dark Horse Presents has won the Eisner Award for Best Anthology five times and the Harvey Award in the same category nine times. The contributors to this last issue include Shannon Wheeler, Ron Randall, Paul Levitz and Tim Hamilton, Ryan Browne, and Carla Speed McNeil. Sad to hear this. Another anthology bites the dust, after Islands last issue recently. I know logistically it would be quite tough but what about doing a weekly/bi-weekly anthology series? It’s been working for 2000AD for the last 40 years. I really think the monthly aspect to anthologies hinders their momentum. Bummer. Was looking forward to seeing the end of the current Finder arc, anyway. Course, they’ve left the door open for another relaunch. If there’s a new #1 next year, I’ll be happy with that. This really makes me sad because I had preordered 5 copies of issue 34 through my LCS. Why? Because the model for Steve Rude’s cover painting is my wife.